Home » bbc , doctor who , science fiction , television , the end of time » Review of DOCTOR WHO Christmas/New Years special "The End of Time"
Review of DOCTOR WHO Christmas/New Years special "The End of Time"
Good (Time) Lord... it's been ages since I've done a write-up about Doctor Who! The last time one appeared on this blog was when "The Next Doctor" Christmas special aired twelve months ago. 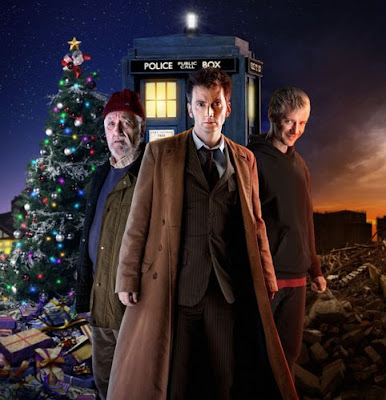 Thankfully, BBC America aired "The End of Time" Part 1 last Saturday night: a day after its Christmas Day premiere for our Brittish brethren across the pond... meaning that for the first time ever I didn't have to download it off the Intertubes via BitTorrent. But I didn't want to share my thoughts on it until Part 2 aired stateside this evening. It just finished so here we go! I've mixed feelings about "The End of Time" but in general, I found it to be a rollickin' and satisfying finale not just for the David Tennant era, but also for Russell T Davies' turn as first showrunner of the revived series. The two things that I didn't like so much were how the Master (who's been brought back to life and again portrayed by John Simm) was handled. I mean, The Master is the Doctor's equal and nemesis... and he's been reduced to cannibalizing homeless people?! Neither did I find his gimmick about turning all of humanity into "the Master race" all that becoming the character. The other thing that bugged me is that "The End of Time" seemed too much a monument to Davies' turn as Doctor Who's head producer. I can understand a little "patting on the back" but the problem is that Davies is obviously focused more on "his" Doctor Who and ignoring the rest of the forty-some years of the show's mythology. In spite of those two quibbles, "The End of Time" is a hell of a fun ride. It was wonderful to see Bernard Cribbins return as Wilfred Mott (I'd pay good money just to see a spinoff devoted to him) and I liked that Donna (again terrifically played by Catherine Tate) got to have a happy ending after all. For all the wrapping-up of the Russell T Davies era in "The End of Time", I couldn't help but think that there were an awful lot of seeds for future stories sown. The mysterious woman (played by Claire Bloom) that only Wilfred seems capable of seeing has been said to be (POSSIBLY HUGE SPOILER, highlight with mouse to read) the Doctor's mother. 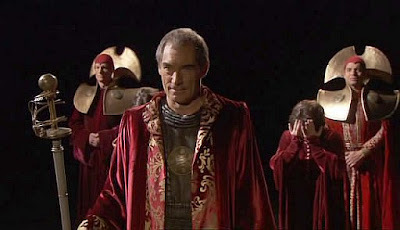 And there's also the little matter of Timothy Dalton's character being none other than (SPOILER AGAIN so highlight once more) Rassilon, the very founder of the Time Lord society. Just two guns, among many, hanging on the walls waiting to be fired. But more than anything else, this was David Tennant's swan song as the Doctor. Tennant has done a remarkable job with the role in the past four years, and "The End of Time" gives him perhaps the most bittersweet sendoff for a Doctor since Tom Baker's tenure came to a close. The final several minutes unspool in a series of vignettes as the Doctor visits most of the companions that he's traveled with during the past several years, before going back into the TARDIS for his most explosive - literally - regeneration scene ever. "The End of Time" gets 4 and 1/2 Sonic Screwdrivers out of five from this reviewer! What sayeth this blogger of Matt Smith as the Doctor? Based on the few seconds that we see of him at "The End of Time", this is gonna be a helluva great ride! Let the word go forth boldly: the Eleventh Doctor has come, with none other than Steven Moffat (scribe behind "The Girl in the Fireplace", "Blink" and the stunning "Silence in the Library"/"Forest of the Dead" two-part story) at the helm as new Doctor Who showrunner! Yeah, I would give this two parter Doctor Who travesty a -10 out of 10 stars. So I guess you're part of the "New Who," who have never watched the original series. I don't understand how you, and the others who liked this horrific finale, can just simply ignore how utterly retarded the episode was. The master is brought back from the dead via a voodoo ritual and then takes control of a TELEPORT device and turns the device into a device that changes all of the humans on the Earth into "masters." The Time Lords then send a diamond across space and time to establish a link with the master so that they can teleport to Earth to do ??? and then somehow, magically and for no reason, the entire planet of Gallifrey appears right next to Earth (causing no ill effect). apparently has awoken and is REALLY PEED OFF, and although he had previously attained the secret of immortality, he now wants MORE immortality, and to magically transform the time lords into some super energy space beings who transcend space and time... EVEN MORESO! The Doctor isn't killed by Rassilon, or the Master, but an evil radiation room? Come on! Then the doctor apparently has time (ha, ha, time pun) to travel the universe righting all those wrongs before he regenerates. Oh, and RTD managed to RUIN the "weeping angels" by having them as "fallen time lords." Pretty much RTD's trademark was the Deus ex machina. RTD was quite fond of putting the Doctor in impossible situations only for the doctor to get out of the situations by literally having some utterly impossible event happen. RTD constantly took the control away from the Doctor and put the fate of the universe in the hands of pure utter luck, or worse, in the hands of his companions. I lost any faith in RTD when he changed the origin of the Cybermen from Mondas/Telos to Earth. Sure, you can argue, "Well, the series was a reboot!!!!" Yeah, it was and it wasn't. RTD cherry picked what he wanted to use from the original series and then "bleeped" on everything else. Goodbye RTD, and please don't ever return as a guest writer on the show. It's going to take years to repair your damage to Who. Oh, and I forgot about the overt Obama worship. "Barack Obama will lead us ALL into a new age of prosperity." I agree it was a good ep and I enjoyed it. I agree about your thought on the woman. I expected The Doctor to say it. I'm looking forward to Steven Moffat's run. I hope we see the start of The Doctor and River's relationship. Plus I'd like to see more of the inside of the TARDIS. This is indeed going to be a wild ride . . . . for someone blessed (or cursed) to have the same name as me.